The current recovery program is not actually a “recovery” program — it is a “breeding and stocking” program. 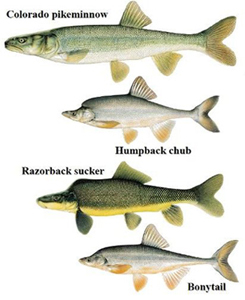 In order to actually recover the fish, the program needs to create natural habitat in which the fish evolved, not just breed more fish and throw them in the degraded habitat in which the fish became and continue to be endangered. The program is currently a “pay to play” program in which anyone who wants to divert more water out of the Colorado River ecosystem can simply pay more money into the program. Because the program is not actually recovering the fish, throwing more money at it does not lead to increased recovery. The federal government (Bureau of Reclamation, Army Corps, and Federal Energy Regulatory Commission) is supporting even more dams and diversions out of the river which will decrease the amount of water in the river thereby further endangering the fish. Climate change has already decreased the amount of water in the river and is expected to even further decrease it. The federal government must address the climate change problem in the Colorado River basin in order to address the problem with the endangered fish. The natural habitat — which includes warmer water with sediment and food in it — no longer flows in parts of the Colorado River because the dams have blocked it. The biggest offender is Glen Canyon Dam, which is the primary reason the fish have become endangered in the first place. In the “Upper Basin Drought Contingency Plan” “Pilot Projects”, the federal government is supporting the exact opposite of what needs to be done to recover the fish — the govt is trying to re-jigger the entire Colorado River management system to continue operating the electric turbines at Glen Canyon Dam to keep the Dam operational. This will continue to ensure that the fish are endangered. Glen Canyon Dam needs to be torn down. Numerous problems in the Colorado River basin need significant reform, and most of them are all hitched together. The ESA recovery program for the four endangered fish needs significant reform. The “Endangered Fish Recovery Programs Extension Act of 2017” should continue to fund the program and reform the program along the lines itemized above. 2017 UPDATE: We’re taking action to stop the Dam attacks, and we need your help! Colorado River Update! Save The Colorado’s River Protection Makes The News!